Firstly here is my collection as it currently stands. Nazgul and Black Numenorians on the left, behind them my Mumaks and to their right some Haradrim (for the Mumaks). 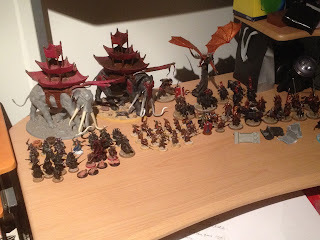 The right hand side are my Easterlings and Khandish forces. My Harad and Umbar force is rather small, and I also have some misc. stuff lying around, so I thought I'd fold them all into my Easterling army as small allied contingents. The Mumaks and their crews I am going to repaint to match my Easterlings, while the Nazgul and friends will remain in their dark palette, but all will be given bases to match. I then plan on adding some more Easterling infantry to match/exceed the number of Haradrim in the mumakil howdahs. 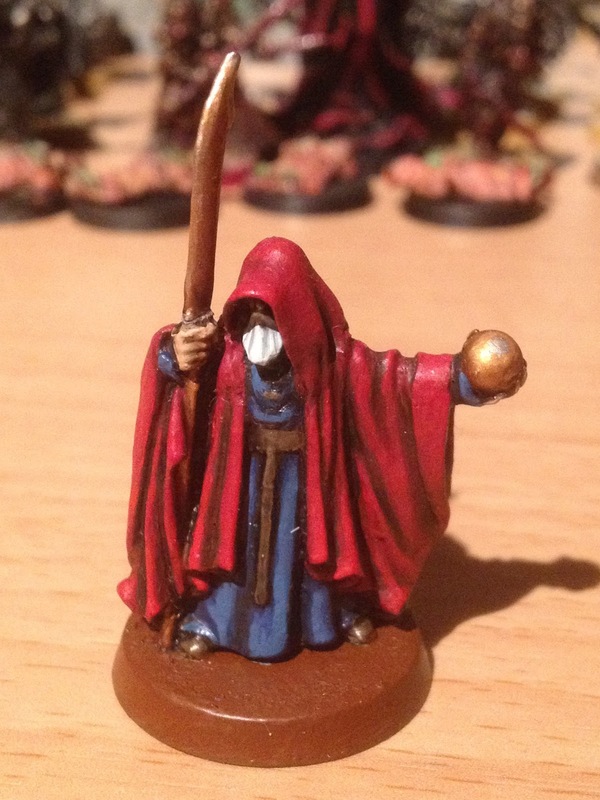 I've decided to include the two Blue Wizards in my army. Tolkien changed his ideas on what happened to the two wizards who ventured into the east. Initially he thought that they must have failed in the purpose in some ways and perhaps founded secret cults of magic. Later, he wrote that they helped destabilise Sauron's dominion over the men of the east, vastly reducing the size of Sauron's armies during the War of the Ring. For the purposes of this force I have decided to go with the earlier ideas that they both failed in their task to hinder the Dark Lord, and like Radagast and Saruman they have chosen to pursue their own agendas. In this case I have imagined Alatar as having become enraptured by the warrior-cult of the Easterlings (possibly due to his origins as a maiar serving Orome, the huntsman of the Valar), while Pallando becomes the founder of cults of magic, delving into the science of the world like Saruman did but for the sake of knowledge itself rather than with conquest in mind. I imagined that such straying from their path and integration into eastern society, has led to some warping of their names into Al'atan and Pallandor, and I shall be using them as an Easterling Dragon-Knight and War-Priest respectively. I originally bought this fell beast to serve as a dragon in my Dark Elf army and still bears their colours. As the old world has now been destroyed I decided it was time I brought this miniature home to LOTR. 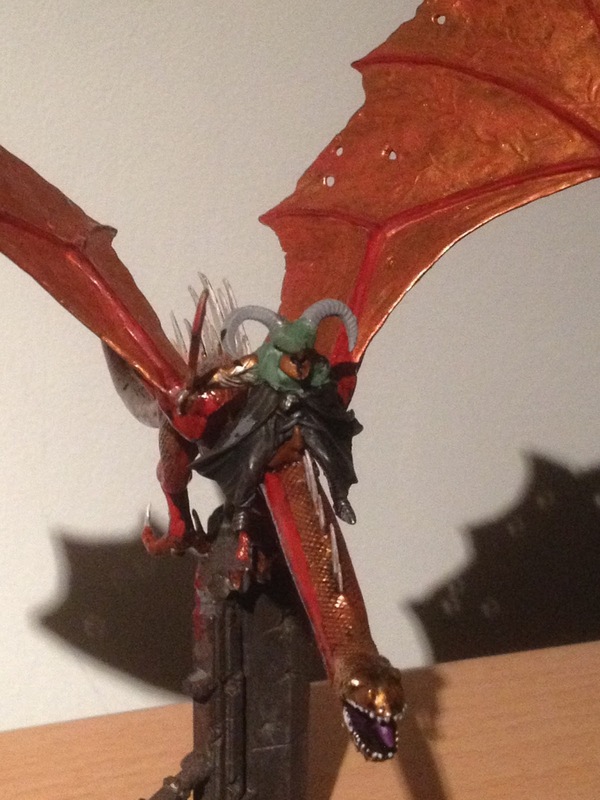 In order to make Khamul identifiable, rather than just another ringwraith and more interesting than just painting him red and gold, I have converted the Nazgul rider to evoke the look that Khamul has in the final Hobbit movie with a horned Easterling helmet and I've added a spare Kataphract arm with scimitar. 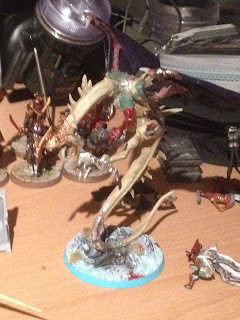 The very first fell beast I owned has been converted for various LOTR and WHFB projects over the years but I decided to bring that home as well. When using it as a dragon for my early Dark Elf army (before I got the plastic one), I added a set of arms from an old troll to bulk it out a bit. 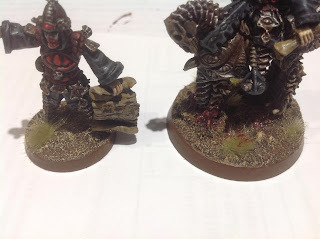 These have been re-added to the fell beast, and a helmet crest made from a Skelton's khopesh has been left on from when it was part of my Tomb Kings (the original helmet spike having been broken beyond repair some years ago). The original wings are lost to some other project but I randomly had a spare pair of LOTR dragon metal dragon wings lying around I've used instead making this miniature quite a hodgepodge legacy of many different projects! I'm yet to finish green stuffing all the joints but I'm rather pleased with how this is progressing. So this is turning into a bigger project than I thought it would (they always do) but I'm hoping to have a rather nice, well painted LOTR force filled with plenty of fun conversions at the end of it. Work on this project will no doubt be fairly sporadic and incremental but I feel I'm going to have plenty of fun making this army feel unique, and you never know; I might actually finish it!